April 5th 2019 - Augusta, GA – It’s that time of the year again! This Sunday is the start of Masters Week and for the sixth year the festivities are kicking off with The Drive, Chip, and Putt Finals at Augusta National. 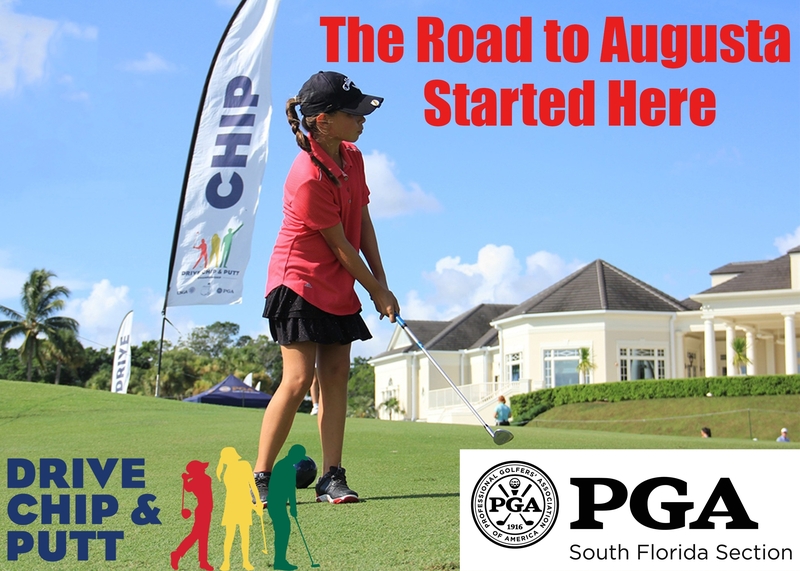 This year at the Drive, Chip, and Putt Finals the South Florida PGA will be represented by three outstanding young golfers: Talia Rodino, Ariana Silva, and Ryan Nana Tanke. This is Rodinos fourth year of participating in the Drive, Chip, and Putt program and her first finals appearance. She made it to the second round qualifying at her home course of Stoneybrook Golf Course in Estero. The Local Qualifier then took her to the Sub-Regional Qualifier at Bonita Bay Club and then on to the Regional Qualifier at TPC Sawgrass. Rodino is one of ten girls competing in the girls 14-15 age division. Ariana Silva will represent the section as well in the girls 10-11 age division. Silva of Weston, Florida made in through the Local Qualifiers for the first time this year having tried qualifying locally in 2016 and 2017. She then went on the Sub-Regional qualifier at Lost Tree Club where she moved on the Regional Qualifier at TPC Sawgrass. Ryan Nana Tanke of Palm Beach Gardens, Florida is taking on the finals in the boys 7-9 age division. Nana Tanke qualified locally at his home course of PGA National, which moved him on to the Sub-Regional Qualifier at Lost Tree Club. He then went on to TPC Sawgrass where he qualified in just his second year of participating. Coverage of the Drive, Chip, and Putt Finals will air on the golf channel on Sunday April, 7th starting with Morning Drive at 7 am and live Drive, Chip, and Putt coverage starting at 8am- 1pm. Live Streaming of the coverage will also be available through the Golf Channel app. Make sure to tune in and cheer on our South Florida junior golfers.